Error plots show how well the complexity of a mesh matches the complexity of the model. Once the mesh matches the complexity of the model, the reported error is low. As a guideline, Pressure Vessel Engineering uses 5% error as an acceptance criterion. This report examines the accuracy of stress results near an area of discontinuity as the mesh is refined. The 5% error criteria estimates the errors in the mesh except in areas of very low stress located near high stress areas. These areas are not usually of interest in a pressure vessel study. In this study, stresses are measured at 5 fixed locations in a simple shape as the mesh size is changed. 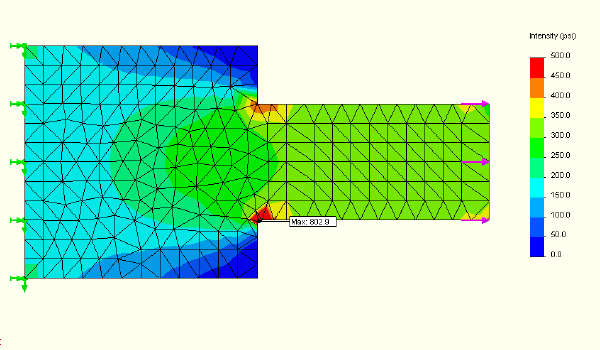 The stress errors predicted by the error function are compared with ultimate stress predicted from mesh refinement. SolidWorks Simulation Designer 2008 SP5.0 FEA software is used for this report using 2nd order shell elements. The test shape – a simple flat plate modeled at 1/4″ thickness. The model has a sharp radius and a sharp corner. Test data will be taken near the sharp radius and at the sharp corner. The surface is split to provide test areas 1 through 5 at fixed locations regardless of the mesh size used. The applied load is a 500 psi force at the right edge. The left edge is fixed. The shell model is meshed at 1/4″ thick. 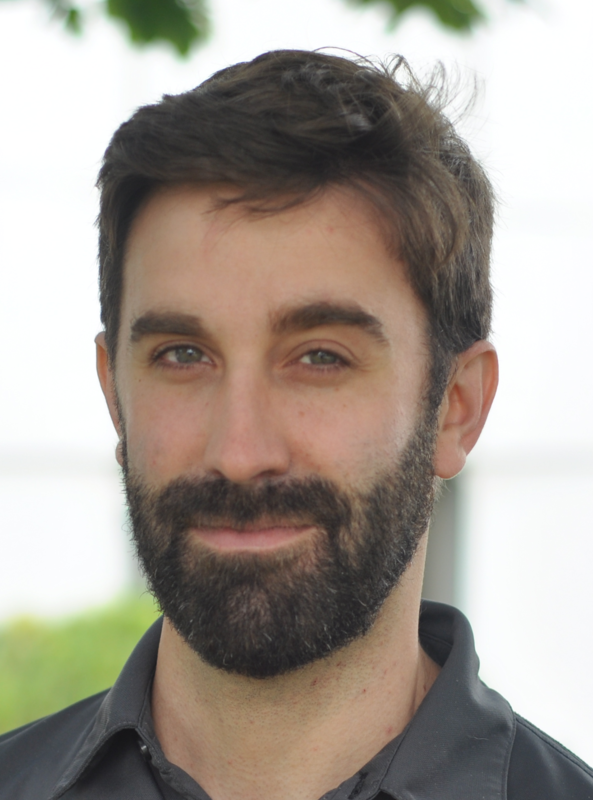 The stress results at 1″ mesh size. Stress Intensity (Tresca*2 or P1-P3) is used for all pictures. 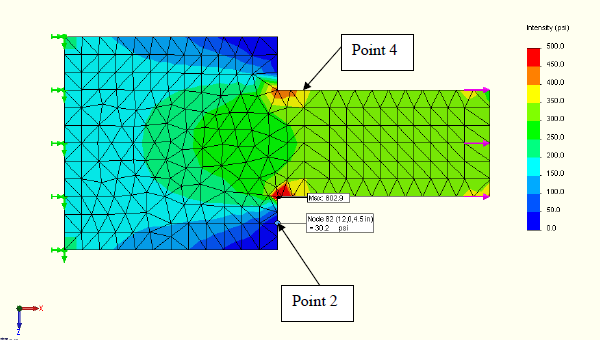 The error plot for the 1″ Mesh size – results for areas 2, 3, 4 and 5 should not be used. 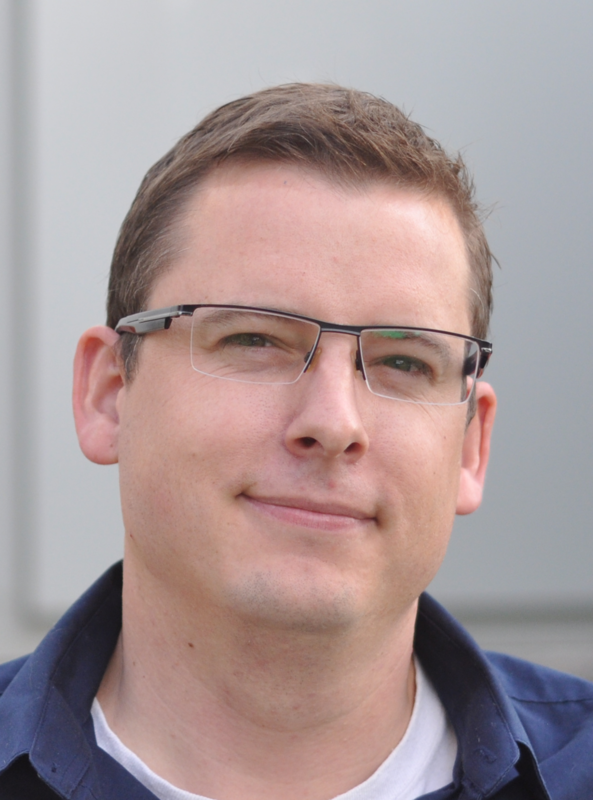 Elements with errors greater than 5% are within 1 element of the test node locations. The result for test node 1 can be used. Mesh sizes 1/2″ through 1/8″ all produce acceptable results for test nodes 1 to 4. 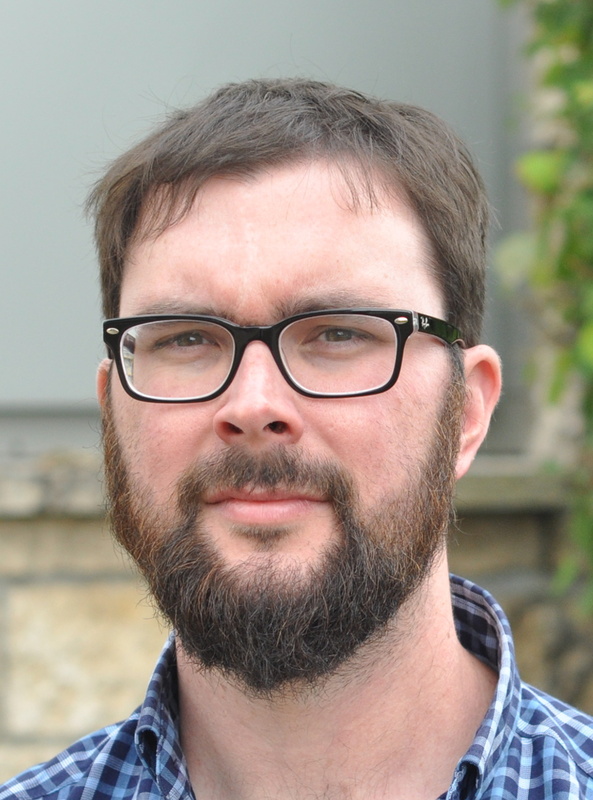 Test node 5 is unacceptable for all mesh sizes. The overall stress pattern for the 1/16″ mesh size – shown as Tresca stress intensity (P1-P3). How accurate are these stress values? 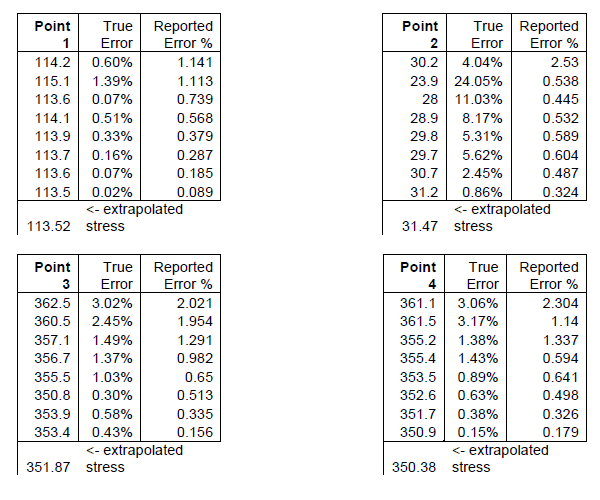 Stress and Error results for the 5 test points. 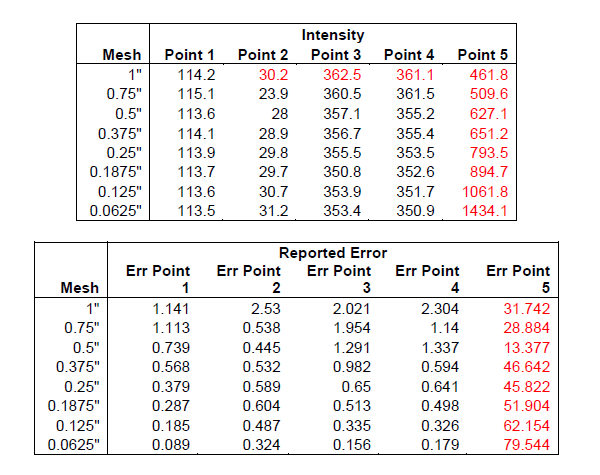 All data for points 1-4 meet the 5% acceptance criteria, but points 2-5 were previously disqualified at the 1″ mesh size due to being within 1 element of areas of >5% error. Point 5 fails the criteria for all mesh sizes. Point 1 – all stress results show an error of less than 5%. The ultimate stress is extrapolated to 113.52 psi. Point 2 – all stress results show an error of less than 5%. Stress at 1″ mesh size has been disqualified as being within 1 element of a node with greater than 5% error. Point 3 – all stress results show an error of less than 5%. 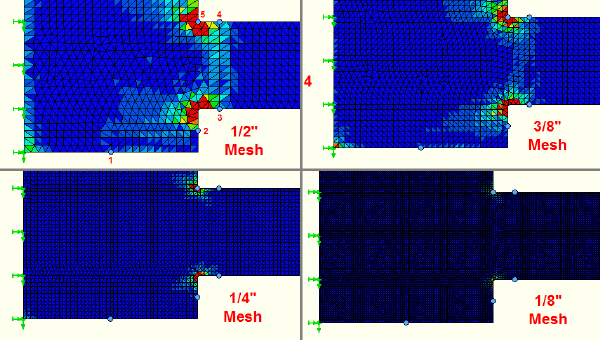 Stress at 1″ mesh size has been disqualified as being within 1 element of a node with greater than 5% error. The ultimate stress is extrapolated to 351.87 psi. Point 4 – all stress results show an error of less than 5%. Stress at 1″ mesh size has been disqualified as being within 1 element of a node with greater than 5% error. The ultimate stress is extrapolated to 350.38psi. Point 5 – all stress results show an error of more than 5%. Stresses at all sizes are disqualified as being over 5%. The ultimate stress is extrapolated to infinity at 0 mesh size. 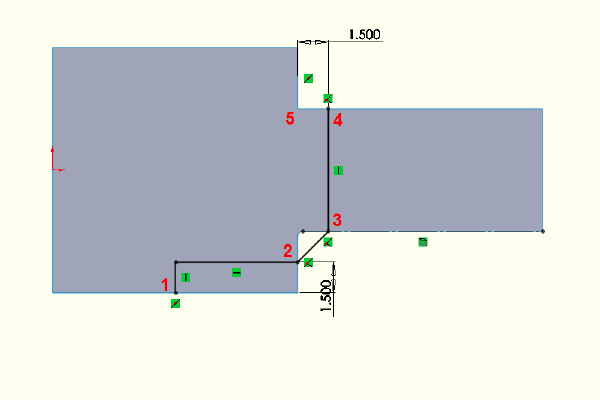 The ultimate stress allows the SolidWorks Simulation error estimate to be compared to the true error. The true error is (actual stress – ultimate stress) / ultimate stress. The graph of the predicted error from the SolidWorks Simulation error functions vs. the true error. The predicted error is not very good for point 2. Point 2 is a very low stress area of the model. The results for point 2 change a lot as the mesh size changes and are not accurate. 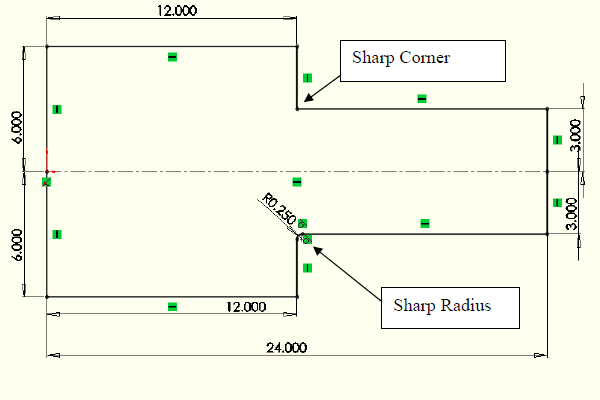 Point 2 is a low stress area adjacent to a high stress area (the sharp radius area) on the model. As the mesh is refined, small changes in the mesh in the radius area have large effects on point 2. The error function can not predict the error for this situation. 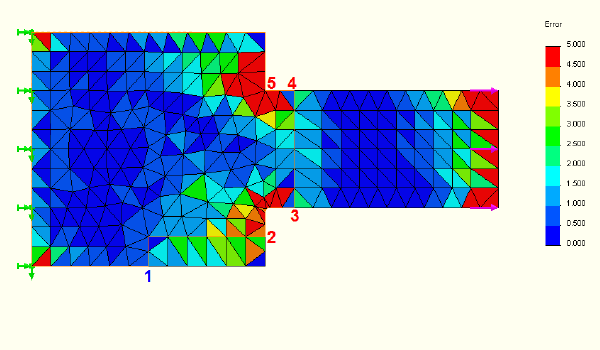 Areas of low stress are not usually of interest in pressure vessel finite element studies. The same error results with point #2 removed. 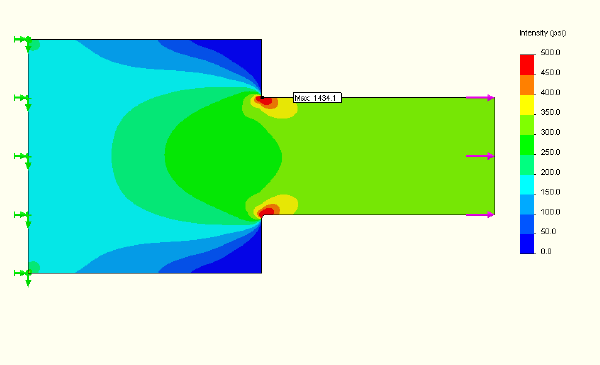 The graph shows good correlation between the extrapolated true stress and the reported error from the SolidWorks Simulation error function. The true stress is approximately 1.49x the reported stress for points 1, 3 and 4 for this shape. 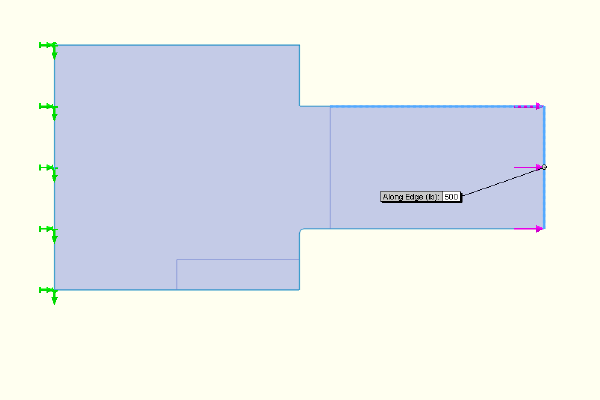 The SolidWorks Simulation Error function will not work for all locations on a model. For this model, the error results for Point 2 – a low stress area adjacent to a high stress area – were found to be not useable (the reported stress was too low vs. the real stress). Areas of low stress like this would not normally be of interest in a pressure vessel study. As a guideline, at Pressure Vessel Engineering we use caution when viewing results at a node when there are elements within 1 node that have errors over 5%. Point 5 – the sharp corner – never achieved an acceptable error level of 5% or less. The theoretical stress at a sharp corner is infinite. As the mesh size was reduced, the stress followed a curve towards infinity. The error function correctly showed that the results for that node were never usable. With these limitations in mind, the error function is a useful predictor of the accuracy of the calculated results without the need to run multiple mesh size runs. The error function checks the results for entire models vs. mesh refinement which only validates the actual points under study.